Yesterday marked an important milestone…in exactly 8 weeks, on Sunday September 11, Rachel and I will be riding in the 2011 JDRF Ride to Cure Diabetes. On that day we will pedal the 78 miles around the circumference of Lake Tahoe along with groups of other folks riding for the same cause. My training for this started several weeks ago, and I must say that my physical conditioning has gotten noticeably better along the way. 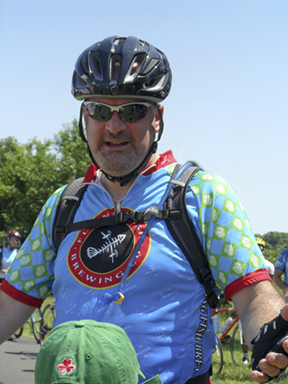 Yesterday, as a part of my training, I participated in the American Cancer Society Bike-a-thon here in South Jersey. Along with thousands of other riders who were helping to raise money and raise awareness for this important cause, I rode the 50 mile route…I started by myself, but after the first 15 miles I met up with some friends from my neighborhood with whom I ride during the week…that’s when it got really got fun!! We rode the next 30 miles at an average speed of 21 mph!!! I had no idea I could do that…felt like a Tour de France cycling star!!! Being a 40-something year old guy who just got back on a bike, I thought that this was a tremendous accomplishment! Ryan took this photo of me as I crossed the finish at the 2011 ACS Bike-a-thon. The little green hat is Jake coming to give me a big hug!! Why is this so important?? Why have we decided to to a bike ride this year?? Jake and Matt must live with Type 1 Diabetes every day, and until we find a cure, I will need to teach them at least two important things. First, they need to stay physically fit. By getting myself off of the couch and back into the saddle, I set a good example for them by making healthy living a priority. Second, and probably more importantly, by accomplishing things that I did not think were possible, I show them that they WILL be able to overcome the challenges put in front of them. Since I started my training rides in May, I have personally logged nearly 500 miles (about the distance from Washington DC to Boston!!! ), and I will keep plugging away every day so that ultimately I can climb the mountain passes at Lake Tahoe and successfully complete this personal challenge that seemed a far reach just a few months ago. As that relates to our battle against T1D, we must keep traveling the road toward beating this disease one mile at a time, and eventually we will win the race for the cure!! To that end, I still need your help! Our fundraising goal is set at $15,000 and we are almost there. Please help me in one of a few ways…first, please click or copy this link ( http://www2.jdrf.org/goto/teamkasper ) and make a donation today!! Every penny counts and we appreciate any contribution no matter how large or small. Second, if you already have made a donation (for which we are very grateful! ), please forward this note, share it on your FB wall, tweet it, or email it to your contact list so that others see that you have a friend in need of their help. I think you would be shocked to find out how many of your friends and extended family have some connection to this disease, and they just may be willing to help get us to our goal. Third, come out and help support our team!! The South Jersey JDRF riders who are training this summer for the Ride to Cure Diabetes would love to grow our group. If you are a cyclist, a beginner or a seasoned pro, come out for a training ride with us…just let me know your interested and I’ll make sure we add you to our list. In exactly two months, Rachel and I will conquer the Tour de Tahoe and hopefully we will be $15,000 closer to conquering Type 1 Diabetes. I know we can accomplish both goals!! Rachel and I have decided to participate in the 2011 JDRF Ride for the Cure at the Tour de Tahoe. Please let me tell you why. For the past several years my family has been involved in the Walk for the Cure. The Walk is the main event in JDRF‘s efforts to raise money to find a cure for Type 1 Diabetes. Well, there is still no cure, and as a result 2 of my three sons must do many things every day that other kids their age don’t have to worry about. My two sons still need to check their blood sugar multiple times every day. They continue to be tethered to insulin pumps. They continue to be hooked up to continuous glucose monitors. They get needle sticks to change those insulin pump sites every three days. They go to the school nurse to have their blood sugar checked when other kids go right to gym or lunch. They sit on the sidelines of the lacrosse game because their blood sugar bottomed out even though it’s their shift to play. They watch other kids eat all of the things that they truly desire but know would be very bad for them to eat. They have to remember to never leave the house without their “kits”…the supplies that the require to take everywhere they go. They trade in their Halloween candy. They wear medical identification everywhere they go…or at least they’re supposed to…. (Matt, are you wearing an ID today???). They add up every carbohydrate for every meal and snack they eat. They end up in the hospital when they get a routine stomach bug. They get woken up in the middle of the night, sometimes more than once, to have their blood sugar checked and they’re tired the next day because of it. They have parents who have not slept through the night since the day of their diagnosis. They have a brother who wonders whether or not some day he will become diabetic. They have to do all of this, and more, in order to avoid immediate life threatening emergencies and/or long term co-morbidities of T1D such as heart disease, blindness, neuropathy, and kidney disease. I’m tired of waiting for the cure…I’m tired of walking…it’s time to step up the pace!! To those of you who know me, it’s no secret that I need to work on getting myself into better physical shape – that is not an invitation for snide remarks in reply – You’ll see that I’ll handle that on my own shortly if you keep reading. It’s also no secret that Rachel and I have worked tirelessly to raise money to help cure Type 1 Diabetes. So, it seems that an opportunity to put the two together is the perfect combination!! This year our South Jersey JDRF Walk takes place on a weekend that we will be in Boston celebrating the Bat Mitzvah of one of our cousins. Although we won’t be here for our Walk this year, Rachel and I feel strongly that we need to continue our efforts in funding the research that will come up with a cure for our sons. At the same time we acknowledge that the training regimen for the walk does not accomplish my goal of losing weight and improving fitness. So in an effort to continue our JDRF fund raising efforts, and in the interest of transforming my abdominal keg back into a six pack, we have decided to step up the pace of both our exercise routine and our fund raising. Yesterday we registered to participate in the JDRF Ride to Cure Diabetes in Lake Tahoe in September. We will be riding the 72 mile circumference of Lake Tahoe with lots of others who have the same goal. As we train over the next few months, and as we ride through the High Sierras, we’ll be focusing on that long list of stuff that my kids need to do, and hope that it inspires us to pedal our way through the ride to help cure Type 1 Diabetes. What can you do to help? Well, if you’re up for one of the most scenic bike rides in all of the United States and want to help raise money for a great cause, then click this link to sign up and join us. If you’re not that ambitious, but you are feeling generous, then please feel free to click in this link (http://www2.jdrf.org/goto/teamkasper) and make a donation to help support our cause….we would truly appreciate the support! I know that riding 72 miles in the Sierra Nevada mountains won’t be easy. But it’s nothing compared to the feat that my kids, and everyone else with T1D, accomplish every day in beating this disease. I know we can beat it for good, and I’m not gonna stop trying until we do! I am the parent of three school aged children, two of whom have Type 1 Diabetes and I want to take a moment to educate you about a growing concern that I have about the health and well being of the students in your classrooms. Perhaps you don’t know, but November has been designated as National Diabetes Month, and November 14 was World Diabetes Day. The designation of this month is based upon some staggering statistics that, in my opinion, are not being taken seriously by our educational system – the place that our children spend the vast majority of their waking hours – and you are helping the problem grow worse. According to statistics published by the Juvenile Diabetes Research Foundation and the American Diabetes Association there are currently an estimated 18.2 million people in the US who suffer from Diabetes…that’s 6.3% of the total population. Further, they estimate that in the next 15 years another 44 million people will be diagnosed. Of those, as many as 3 million have Type 1 diabetes and more than 15,000 kids will become newly diagnosed in 2011…that’s one out of every 500 children under the age of 18. Among those 3 million kids are two of my three sons, Matt and Jake…and they’re in your schools! Foods of minimal nutritional value may not be served, sold or given out as free promotion anywhere on school property before the end of the school day. All forms of candy may not be served, sold or given out as free promotion anywhere on school property before the end of the school day. 1. Why are my children allowed to spend their lunch money on candy, ice cream and soda, all of which are prominently displayed and sold in my children’s school cafeterias? When my kids are at home they don’t get to have these things as routines snacks. They are reserved for special occasions and are not part of the daily diet. In fact, my kids love when we have freshly cut fruit and veggies on the table when they get home. I wonder whether our society would solve the ever-expanding (pardon the pun) problem of childhood obesity if these choices were systematically eliminated from their lunchroom options. If the school took a stand and eliminated 100% of this stuff, what would be the harm, and who would have the gumption to actually complain about it? The life a a kid with Type 1 Diabetes revolves around so many factors…candy and treats at school should not be one of them! 2. Why does nearly every day need to be a “special day” in the classroom, where parents are permitted to send in cupcakes, cake, brownies, candy and other “treats” that have little or no nutritional value? I’m not sure about you, but I see no need for my child to have cake and brownies at morning snack time, followed by a Pepsi and an ice cream taco in the lunch cafeteria an hour later. When I was a kid, we exchanged Valentines Day cards with our classmates and I would come home with a stack of notes asking, “Will you be my valentine?” My kids, on the other hand, came home with a bag of candy (contents shown in the photo below) that weighed nearly 2 pounds last February…it’s just not necessary! I must say that we are fortunate this year, because Jake’s teacher gets it and the junk in the classroom has been toned down. Note to school systems: Please don’t call parents and complain that our children are hyperactive and out of control in the early afternoon and then seem sleepy and aloof by the end of the day when you have just provided them a week’s worth of sugar to rev their engines shortly after which they crash…it’s the system’s fault, not ours and not the kids!! 3. Why have seven (7) years gone by and no significant changes have been made based upon the aforementioned Healthy Kids recommendations? It seems odd to me that my children learn about the Food Pyramid in health class, yet in the very building where they are taught about the relative nutritional value of their food choices, they are able to make every bad choice that just about any kid would make when their parents aren’t around. How ironic that my kid could take a test in health class and potentially get it wrong, when the poor food choice behaviors are being reinforced by the schools at lunch…right before that test. Please understand, making these changes will not cure the Type 1 Diabetes that impacts my children…I know that. I’m also not blaming the schools for my kids’ disease. However, it is a huge, yet preventable, problem when my son has a blood sugar of 500 at the end of the day – which may easily have impacted his performance in the classroom – because he bought an ice cream and did not take any insulin to cover it. You see, Matt is a teenager and given a little freedom he does not always follow the rules and we do not know that he has done stuff like this until we download his pump and ultimately find that his HbA1c has gone from 7 to nearly 10 (yup…embarrassed to say that happened last year)!!!. That’s why we need your leadership and your help! So, in honor of Diabetes Month and World Diabetes Day, I am asking you to please help make our schools a healthier place for our children. Please pay attention to the 2003 recommendations. Please help my kids avoid having the long-term complications of a life with Diabetes that include heart disease, kidney disease, blindness, neuro-vascular disease, and more. Please become a partner with parents in educating and reinforcing healthy life-styles by fostering them in your buildings every day. If you can help me do that, I’ll stop picking on the school systems! Thank you. Oh – by the way – if you’re a concerned parent feel free to share a link to this entry with whomever you think might listen! !